A Review by Geoff Bradley: FREDRIC BROWN – Night of the Jabberwock. FREDRIC BROWN – Night of the Jabberwock. E. P. Dutton, hardcover, 1950. Paperback editions include: Bantam #990, April 1952; Morrow-Quill, 1984. British edition: T. V. Boardman, hc, 1951. Based on two pulp stories: “The Gibbering Night” (Detective Tales, July 1944) and “The Jabberwock Murders” (Thrilling Mystery, Summer 1944). After hearing several people tell me about this book, I just had to read it. I went up to the loft and searched but to no avail. Fortunately a couple of days later, when I was looking for something else, I stumbled across my copy. Doc Stoeger, the narrator, is the proprietor/editor of a small town newspaper and a huge fan of the work of Lewis Carroll. After putting the paper to bed and getting home for the evening, he faces a night of catastrophic events, including a mysterious bank robbery, an escaped lunatic, a midnight gathering of the Vorpal Blades in a haunted house, and more. Most of them are unconnected, but after a murder for which he has been framed, Doc is fighting for his life and an explanation that will make sense of what has gone on. That the explanation makes as much sense as it does is a tribute to the plotting abilities of Fredric Brown, who has weaved a tangled web of intrigue. This madcap, humorous affair is a pleasurable romp with a satisfying ending, and I enjoyed the reading of it. Brown is an author that I am underexposed to, having previously only read Madball, which was only so-so, and The Fabulous Clipjoint, the first in the Ed and Am Hunter series, which I somehow didn’t take to. Editorial Comment: Happy Halloween, everyone! A Movie Review by Walter Albert: THAT CERTAIN THING (1928). THAT CERTAIN THING. Columbia, 1928. Viola Dana, Ralph Graves, Burr Mcintosh, Aggie Herring, Carl Gerard, Sydney Crossley. Screenplay by Elmer Harris; photography by Joseph Walker. Director: Frank Capra. Shown at Cinecon 40, Hollywood CA, September 2004. Described as a “restoration in progress” (the film is is a blow-up from a 16mm print), this domestic drama tracks the fortunes of a hotel newsstand clerk (Dana) after she marries Graves, the son of a magnate, who promptly disinherits his son, forcing him to go to work as a day laborer. When his co-workers prefer his wife’s box lunch to their own lunches, he has a brainstorm and starts the “Molly Box Lunch Company,” which takes off and attracts the attention of Graves’ father, who doesn’t know that his daughter-in-law is the Molly designing the lunches. Molly uses her native sharp wits to outwit her father-in-law, roping him into a highly profitable deal (for the company) to which he responds by showing he’s a good sport and finally accepting his husband’s wife. A good-natured comedy drama that makes light fun of big business and the innate good sense of the Little Man (or, in this case, Little Woman). Capra’s first film for Columbia. Steve Holland on the Life of GIL BREWER. On his own Bear Alley blog, Steve Holland has just posted a long essay on the life (and sad death) of Gil Brewer, author of many bestselling paperback originals from Gold Medal in the 1950s before the market moved away from him, compounded by his own struggles with alcoholism. Based on his own research, Steve provides us with substantial evidence as to Brewer’s full name and his date of birth. Some of the rest of his article is based on Bill Pronzini’s well-known essay on Brewer, which can be found online on the main Mystery*File website, but by incorporating information from other sources as well, Steve covers Brewer’s life and writing career as completely and as full of insight as anything that’s been done so far. A Review by Stephen Mertz: THOMAS WILLS – You’ll Get Yours. THOMAS WILLS – You’ll Get Yours. Lion #87, paperback original; 1st printing, June 1952. 2nd printing: Lion LB129, November 1956. Also published as by William Ard: Berkley D2037, pb, 1960. This was the second novel of William Ard, a popular suspense writer of the fifties who is mostly forgotten today. While Ard’s first book, The Perfect Frame (1951) was a good-humored Eye thriller somewhat in the style of Richard S. Prather, this one owes its stylistic inspiration to quite another source. The publisher’s blurb calls Wills: “Fast as Hammett, sharp as Chandler, tough as Spillane,” while actually, in its treatment of lowlife types caught up in a sordid web of greed and lust which they themselves barely comprehend, You’ll Get Yours is most obviously patterned after the work of James M. Cain. It’s as if Cain set out to write a private eye novel. At least, that’s how Ard probably intended it. Barney Glines, a poor but honest private eye, is called in to deliver the payoff for a beautiful millionairess who is trying to buy back some stolen jewelry. Things go wrong, naturally, and before long Glines is caught up almost over his head in a nasty case of drugs and murder, and manages to fall in love with the millionairess along way. The writing is pure Cain, terse and hardboiled, utterly lacking the humor of Ard’s first book. The plotting is also Cainesque. The book is not primarily about a crime or crimes being solved, but about a group of people hurtling themselves headlong toward their own self-destruction. Unfortunately, any suspense inherent in such a storyline is sabotaged by the singularly foolish device of telling most of the book as a flashback — after the identity of the villain (and his fate) have been made obvious in the first chapter! Certainly Glines is a minor creation, in no way as memorable or believable as Ard’s major eye, Timothy Dane, himself the protagonist of nine fine novels. Sure, Ard does an adequate job of imitating Cain, but so what? Who needs imitations? Although I’ve likened Ard’s previous book to Prather, Ard was very much his own man; a superb plotter and stylist in his own right. This one has all the earmarks of a hurriedly produced script to earn Ard some extra pocket money in between his more notable genre work. Lion Books itself was an often seedy, bottom line paperback house of the early fifties, and collectors of old paperbacks will know what I mean when I say that You’ll Get Yours could just as easily have been published by Ace Doubles or Gold Medal. Packaging and content are practically identical. Rate this one a near miss from a first-rate hardboiled writer. The most entertaining portion of the book, for me, was the description of an exotic dancer’s striptease in a club. One half of the girl is made up as a woman, slinky gown, gaudy makeup, all of that. The other half, from head to toe straight down the middle, is made up as a man; short hair, suit, the whole bit. The number consists of the male half trying to feel up and strip down the female half, with the female half desperately fighting off the advances. Now that’s exotic! — This review first appeared in The Not So Private Eye #4, February-March, 1979. A Review by David L. Vineyard: FIONA BUCKLEY – To Shield the Queen. FIONA BUCKLEY – To Shield the Queen. Scribner, hardcover; first edition, November 1997. Paperback reprint: Pocket; 1st printing, October 1998. UK edition: Orion, hc, as The Robsart Mystery. A solid introduction for the Ursula Blanchard series, set at the court of Elizabeth I. Blanchard, a young widow with a daughter she must provide for, has just been made a Lady in Waiting in the Court of Elizabeth I, thanks to her ties to Sir William Cecil , the Secretary of State. While her job is to serve the queen, her keen eyes and bright mind soon find her with more important duties. The year is 1560, and Lord Robert Dudley, Master of Horse to the young Queen, is one of her favorites, and rumors are rife about his relationship with the queen. When Dudley’s wife, Lady Ivy, falls ill Ursula is dispatched to help care for her — and keep an eye on a dangerous scandal that could develop if, as some suspect, Lady Ivy Dudley is being poisoned to take her out of the way for the furthering of the queen’s romance. And when Ivy Dudley falls to her death in a suspicious manner, Ursula finds herself at the heart of a conspiracy against the throne involving a handsome Frenchman and traitors in the Court. Her heart and her courage are about to be severely tested as is her loyalty to the queen. And Ursula will go to extraordinary lengths to both guard her monarch and the Frenchman she loves and marries — not entirely voluntarily. Buckley smoothly blends history and fiction with a heroine who navigates the treacheries of the Tudor court with intelligence courage and wisdom. Whether her solution to the real murder (or not) of Lady Dudley bears any relation to reality, it is in the best tradition of historical mystery, and the depictions of both fictional and historical figures are well done, especially a human portrait of Elizabeth as both woman and monarch. Ursula protects her monarch and the realm, saves her new husband, and secures a unique position with both the Queen and her court as well as winning the respect of the Spanish Ambassador who will play more important role in later books. For fans of historical mysteries, this one is a pleasant discovery, and Ursula Blanchard a protagonist who is both pleasingly modern yet true to her time and place. An excellent debut for a well-written series. 1. The Robsart Mystery (1997), aka To Shield the Queen. A Review by Joe R. Lansdale; MICHAEL KURLAND – The Infernal Device. Professor Moriarty saved us all! At least that’s Michael Kurland’s report in The Infernal Device, a new departure from the Holmes and Holmes influenced stories. The Infernal Device deals with the truth behind that diabolical mastermind, the so-called Napoleon of Crime, Professor James Moriarty. It seems that the Russians — even then — were menacing not only The Empire, but all of the free world, with their nefarious schemes and dastardly deeds. This particular case in which Holmes is involved, peripherally at least, is no exception. But even before Holmes is involved in the case, the government of England has sought the aid of none other than the greatest mastermind of them all, James Moriarty. Of course, Moriarty is so clever, that although it is well known that he is the mastermind behind considerable wrong doing, there is no proof. But this, or so sees the Empire, is the edge. A master criminal against a master criminal. Moriarty against that Russian fiend, Trepoff. And terror of terrors, Trepoff is such a fiend, it takes the (gulp) unbelievable to stop him. The uniting of the greatest minds in Europe. The teaming of none other than Moriarty and Sherlock Holmes. Frankly, I for one, don’t believe a word of it. Moriarty is not a nice guy. Not even for money. Shame, shame, shame on Kurland for telling these lies. But it is an interesting, if a bit over long, book, and worth the 1.95 paperback price. � From The MYSTERY FANcier, Vol. 3, No. 3, May/June 1979. Editorial Comment: Following my review of Michael Kurland’s The Empress of India (2006), a later Holmes and Moriarty adventure, I added a complete mystery-oriented bibliography for him here. 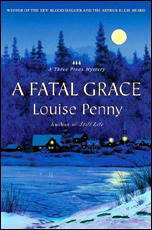 A Review by Tina Karelson: LOUISE PENNY – A Fatal Grace. LOUISE PENNY – A Fatal Grace. St. Martin’s, hardcover; first edition, May 2007; paperback, 1st printing, February 2008. First published in Canada and the UK as Dead Cold: McArthur, Canada, hc, 2006; pb, 2007. Headline, UK, hc, 2006; pb, 2007. Second in the Three Pines series featuring Armand Gamache of the Quebec Sûreté, this tale is set at Christmastime. The timing is leveraged to full effect, with vivid descriptions of gorgeous winter scenes as well as brutally cold, snowy weather. The murder victim is CC de Poitiers (hmmm, an assumed name? ), a thoroughly horrid woman who has recently moved to the village. She succumbs in a rather bizarre way at a curling match, and Gamache must find out why. Office politics in the Sûreté are also at work, and the odious Agent Nichol returns. The plot is a bit of a stretch, and the many copy-editing glitches/ omissions (an ice floe is described as an ice “flow,” for example) often brought me up short. Editorial Comment: There are at the present time five books in the Chief Inspector Gamache series. Walter Albert reviewed Still Life, the first in the series, back here in July. Following his review, I added a list of all five books, along with a few additional cover scans. A Review by Walter Albert: PHIL RICKMAN – The Smile of a Ghost. PHIL RICKMAN – The Smile of a Ghost. Macmillan, UK, hardcover, Nov 2005; Macmillan-Pan, UK, Nov 2006. Imported & sold in the US under the Trafalgar Square imprint. Merrily Watkins is a female Anglican priest. She’s also the diocesan exorcist, but there are elements within the local church that have little faith in her “calling,” and as she attempts to deal with a series of deaths of teenagers — deaths that may be something other than accidental — her special skills are put to tests that could end her special role in the church. Merrily has a daughter, a lover, and a belief in the importance of her role. She’s no conventional cleric, and in spite of her role as an exorcist, this is no retread of the usual horrific events associated with this rite. Most of the atrocities that are committed in the course of the novel are all too human in origin, although there’s a bit of flirting with the supernatural that may put off the conventional mystery reader. Merrily works within the church, with the local townspeople and in an uneasy alliance, with the local police, trying to keep her footing, not always successfully, among these often opposing elements. I’ll probably want to try another of the series. It satisfies two of my chief requirements for good mystery: a well-characterized protagonist and a well drawn setting. As for the meshing and weaving of these elements into a compelling plot, I can only say that if I wasn’t mesmerized by the telling (as the Publisher’s Weekly reviewer claimed to be), I wasn’t put off by it either. The series, at the least, merits another chance. Coming up tomorrow, Friday, October 30th. I can watch Boris Karloff in anything. Bela Lugosi? Not so much.